The port and logistics sector has traditionally been a slow adopter of technology compared to other industries such as financial services, yet in recent years there has been an explosion of innovative technological developments in the sector centred on Industry 4.0. In this industrial age, organisations who are better at exploiting technologies and information are able to gain an edge and competitive advantage over those who are slow to adopt and realise these technologies. Leading organisations who embrace technology and innovation often earn themselves a first-mover advantage. This article examines four key emerging technologies that are revolutionising the Port-Logistics Sector. The Internet of Things (IoT) refers to the network of physical objects or “things” accessible via the internet. These objects have built-in technology that are able to interact with internal conditions or external environment. IoT is composed of sensors and end devices that carry out certain activities connected to the data network over which they communicate and systems for storing and processing data. Each thing is uniquely identifiable. 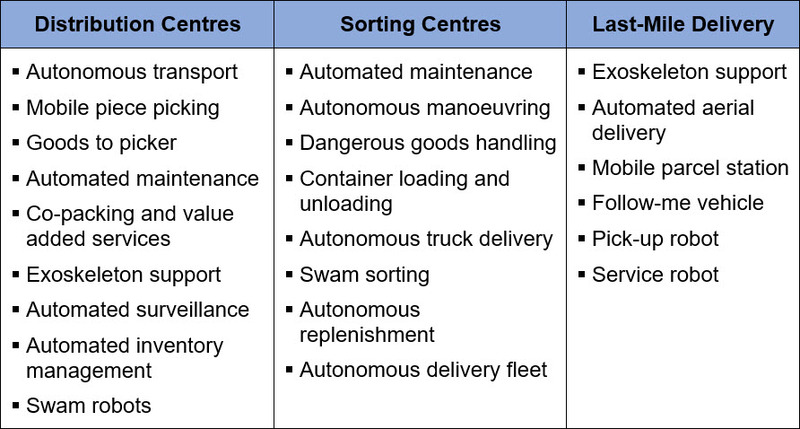 Specific-use cases in the Port-Logistics sector include the optimisation of service properties like delivery time, resource utilisation and geographical coverage. The sensors are combined with data analytics for better optimisation of results. This, coupled with advance predictive techniques and real-time processing provides port and logistics players with better insights and capacity to forecast and allocate resource optimally. At present, the typical applications of IoT in port management include container radio-frequency identification (RFID), electronic seals, port equipment condition monitoring, engineering equipment asset management and wireless automatic meter reading. Some examples of IoT devices deployed include humidity and temperature sensors, gas regulators and locality information trackers. However, such connectivity is not without risk and threats especially without a unified protocol for IoT. A host of complications and challenges can disrupt deployment which may lead to data leakage. In order to prevent the leakage of sensitive data, it is necessary for organisations to enforce strict rules associated with secured passwords, encryption of communications and right of access. Closely linked to the subject of IoT is Big Data. Data analytics refers to qualitative and quantitative techniques and processes used to enhance productivity and business gains. Data collected through various IoT sensors and devices require detailed analysis and insights in order to aid decision-making. Examples on application of data analytics in the Port-Logistics sector are numerous. Data could be used to explore additional revenue streams by looking for transit containers that could potentially be connected via Singapore. Data could be mined to look for such opportunities based on cargo flow information. This should tie in with the intended discharge time of that box to ensure the timeliness of the cargo’s arrival at its point of destination. Specific to the Port Sector, data could be used to improve vessel utilisation by recommending connections to shipping lines. Historical data and predictive models could provide insights into trends and customer patterns to recommend slot sharing opportunities. This also improves the slot utilisation for vessels to achieve a win-win situation for both terminal and shipping lines. Optimisation of transhipment connections could be achieved if we are able to manage and influence customers’ connection selection by gaining insights into the customer’s intentions and considerations for planning certain connections. Also, by analysing the connection patterns, nominations could be recommended. The terminal could manage the container selection based on information of lying boxes in the terminals while managing the time sensitivity of the connections. (c) Route Optimisation – Arrange for most optimal pick-up and delivery for fuel economy, time-savings and reduced mileage with maximum load. The recent hype in Bitcoin provided the industry with a preview of blockchain technology but beyond cryptocurrency, the distributed ledger technology provides for many used cases in the Port-Logistics sector. Blockchain is a shared ledger technology which allows participants to see data. It records all transactions across business networks through replication. The blockchain is a time-stamped, non-repudiable database that contains the entire logged history of transactions on the system. There are 3 main forms of blockchain namely, private, public and federated blockchains. The main advantages of blockchain is that it is traceable, transparent, auditable, secured, collaborative and efficient. Blockchain technology can add value to port logistics and port digitalisation in a number of ways. These are related to building trust, provision of secure data, visibility, network expansion and integration of supply flows. Blockchain in the Port and Logistics sector include the implementation of a blockchain platform which may facilitate the exchange of information among the parties involved in the process. Instead of exchanging documentation, the parties involved in the process are granted permission to access the block where the information is stored. This leads to the creation of a unique, shared piece of information which can be accessed in real-time and with lower transaction costs. This process can be further accelerated by including parties that are currently external to the process, such as banks and insurance companies. The database can be further improved by introducing IoT devices and connecting them as blockchain nodes. For instance, sensors can be placed in the containers to monitor the status of the goods and feed this information back to the insurance company. Furthermore, by linking smart devices with smart contracts, full process automation becomes possible. However, implementation of blockchain is not without difficulty and challenges as companies operating in the port environment are very diversified in terms of size, operational level and resource availability. A significant amount of time and resources are required to align databases and invest in a shared language for the blockchain across all stakeholders. More computing power is also required to implement the blockchain technology on a very large scale. Implementing blockchain technology also raises concerns over the reliability of data provided by suppliers and customers. Resistance may arise over having to integrate data systems to share information across supply chain partners. To alleviate such concerns, neutral intermediaries such as the Port Community Systems have been established in the past. A blockchain configuration changes this perspective since the technology itself works as a guarantee of trust among the parties involved in the process. Once more participants are connected, questions about the governance of the system will arise, such as who is authorized to access data (accessibility) and who owns the data (ownership) shared in the blockchain. There will be a need for a central administrator to take charge of setting the network rules and granting access permission. One specific application of blockchain technology is the introduction of supply chain smart contracts. Blockchain can reduce countless hours of marketplace research, and holds the secure coding of all documentation related to a particular object – patent, warranty, provenance, registration, insurance and inspection certification which helps in gaining control of that object. The revolution in robotics has brought about immense opportunities for the Port and Logistics sector. Robotics is a discipline that involves a fusion of electrical engineering (hardware), sensors, low-cost sensors, powerful batteries, computer science (artificial intelligence), mathematics (logic, error estimation, statistical evaluation) and mechanical (miniaturization, kinematics). Companies such as Amazon estimate that robotics could help it save $400 million to $900 million a year in fulfillment costs by reducing the number of times a product is “touched”. (a) Promote workplace efficiency and employee creativity – Automating repetitive, mundane, or dangerous work frees up employees to pursue jobs that require imagination, adaptability, and decision-making. In that sense, robots ultimately drive efficiency, not replace workers. (b) Drive re-shoring – According to Boston Consulting Group (BCG) research approximately 10% of today’s manufacturing functions are automated, BCG predicts this number will rise to 25% as robotic vision sensors and gripping systems improve. Increasing the use of robots will help to create jobs as well as keep manufacturing work in the countries with high labour cost. (c) Increase employee safety – Each year, manufacturers lose valuable manpower to workplace accidents. According to the United States Bureau of Labor Statistics data reports, slightly more than 3.0 million nonfatal workplace injuries and illnesses occurred in 2013, resulting in an incidence rate of 3.3 cases per 100 equivalent full-time workers. With robots and automated systems replacing workers in many positions, another significant benefit of improved employee safety emerges. New-generation robotic machines are likely to collaborate with humans rather than replace them. With a clear correlation between employee health and workplace engagement, the likely result of such a collaboration is a more fulfilled workforce who can focus more on challenging work instead of safety concerns around the warehouse. In summary, the drive towards productivity and efficiency is a continuous one with new and emerging technologies revolutionising the way we work and interact with each other. The future holds a promise of a more interconnected community and trade. By embracing these emerging technologies, the industry can transform itself into Port and Logistics 4.0. Adrian Goh. MISPMM (2017). “Blockchain Technology – The Next Revolution of Supply Chain”. Retrieved from https://sipmm.edu.sg/blockchain-technology-next-revolution-supply-chain, accessed 10/03/¬2018. Bavani Prapaharan. MISPMM (2018). “New Technologies in the Maritime Industry”. Retrieved from https://sipmm.edu.sg/new-technologies-maritime-industry, accessed 10/03/2018. Cerasis. (2017). “The Future of Supply Chain, Logistics & Manufacturing: How Technology is Transforming Industries”. Retrieved from http://cerasis.com/wp-content/uploads/2015/12/Technology_Manufacturing_SupplyChain_Logistics_eBook.pdf, accessed 10/03/¬2018. Dong Xisong, X. G. (2013). “Intelligent ports based on Internet of Things”. Retrieved from http://ieeexplore.ieee.org/document/6611428, accessed 10/03/2018. Francisconi, M. (2017). “An explorative study on Blockchain Technology in Application to Port Logistics”. Retrieved from https://scholar.google.com.sg, accessed 10/03/¬2018. I-Ming, C. (2014). “Robotic Technology for Port and Maritime Automation”. Retrieved from https://www.maritimeinstitute.sg/data/0/docs/newsfiles/smi-aa-chenim.pdf, accessed 10/03/2018. Kubáč, I. L. (2015). “Internet of Things and its Application in Logistics”. Retrieved from http://www.vslg.cz/wcd/docs/vslg/acta_logistika/5.-rocnik-2015/cislo-1-2015/4-kubac.pdf, accessed 15/03/¬2018. Marissa Oude Weernink, W. (2017). “The Blockchain Potential for Port Logistics”. Retrieved from http://smart-port.nl/wp-content/uploads/2017/06/Bijlage-6_White-Paper-Blockchain.pdf, Accessed 10/03/2018. Oracle Enterprise. (2015). “Improving Logistics & Transportation Performance with Big Data”. Retrieved from http://www.oracle.com/us/technologies/big-data/big-data-logistics-2398953.pdf, accessed 10/03/2018. About the Author: Daniel Lin has 10 years of management consulting experience covering various projects in operations management, procurement and supply chain management. Daniel has a keen interest in business process re-engineering for improved efficiency and optimised performance. Daniel holds a Bachelor of Commerce degree from University of Queensland, as well as a Master degree of Applied Commerce from the University of Melbourne. Daniel is a qualified member of the Singapore Institute of Purchasing and Materials Management (SIPMM). He completed the Graduate Diploma in Logistics Management (GDLM) course on April 2018 at SIPMM Academy.